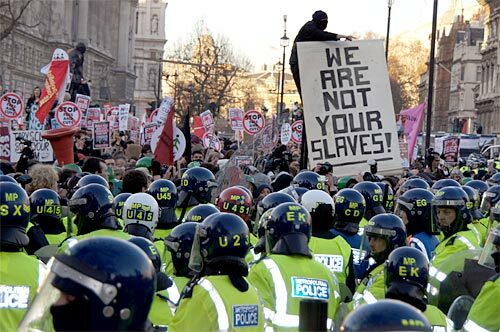 We Are Not Your Slaves! While many school-aged children today think that May Day is about Springtime, this important day in history is concerned with more than leaving flowers on neighbouring porches, as much fun as that is. While we might celebrate Labour Day in early September, May Day is meant to observe a far more important benchmark for worker’s rights. If we live in a free country, then equality, safe working environments, shorter work days, living wages, pensions and benefits should be part of what it means to live in a free and open society. After all, how can we call this a free country if we have the freedom to speak out about political injustices but cannot speak out at work for fear of being fired? They don’t take away our right to vote for protesting, so why can we lose our right to earn an income for simply asking the wrong questions of our employers? Eighty years ago Franklin D. Roosevelt granted American workers higher wages, a 40-hour work week, collective bargaining rights, unemployment, and many other hard-won benefits in the New Deal of the 1930’s. And while that momentous victory is often credited to FDR, we forget that the New Deal was not the brainchild of the establishment, but the result of thousands of coordinated strikes by labour unions and workers standing up to Corporate exploitation. Every one of the rights and freedoms we take for granted today were not simply handed over by the ownership class – our grandparents fought tooth and nail, and many died, to secure those rights. But half a century prior to the New Deal, the true roots of the movement for which May Day is now celebrated were established. While little concern for safety existed in most factories in the early 20th Century, it was even worse in the late 19th century, when relative pay was pitifully low, benefits were non-existent and the work day was often 10 to 12 hours, six days a week. In early America, labour unions were actually outlawed, and considered illegal conspiracies creating restraints to “free trade.” Sound familiar? That changed in 1842, the Hunt case ruling legitimized collective bargaining as legal, granting workers the ability to unionize. At first, these unions were concentrated in small, weak, isolated companies. Starvation wages remained the norm for the majority of America’s work force, who worked as many as 12 hours a day, seven days a week. But as the 1873 financial panic created further economic chaos on top of worsening economic conditions for labour following the Civil War, American workers became increasingly militant. Then, the National Railroad Strike of 1877 that paralyzed the entire country proved that organizational structure was not necessarily paramount to the establishment of collective bargaining forums; it had not been led or organized by any labour union. Instead, the strike grew spontaneously and organically from the Railroad workers themselves. President Rutherford B. Hayes ordered State and Federal troops to crush the strike, resulting in the deaths of more than 100 strikers in skirmishes across the country. This prompted workers of all industries to organize, first with the Knights of Labour, who had assembled more than 700,000 strikers by the 1880’s, then with the Federation of Organized Trades and Labour Unions, which would later change its name to the American Federation of Labour (AFL). Two years later Chicago was again the stage for the May Day strikes of 1886, when the workers at the McCormick Harvesting Machine Company began a strike in the hope of gaining a shorter work day. On 3 May, police were used to protect strikebreakers and a scuffle broke out, resulting in one person’s death and the injury of several others. But this skirmish was just a warm-up. Nobody could foresee what would take place on the following day. On 4 May, a large rally was planned by anarchist leaders to protest police brutality. Sound familiar? A crowd of 20,000 demonstrators was anticipated at Haymarket Square, where area farmers traditionally sold their produce. Rain and unseasonable cold kept the numbers down to between 1,500 to 2,000 and the gathering was peaceful until one police official, in contravention of the mayor’s instructions, sent units into the crowd to force it to disperse. At that juncture, a pipe bomb was thrown into the police ranks. The explosion took the lives of seven policemen and injured more than 60 others causing the police to fire into the crowds of workers, killing four. A period of panic and overreaction followed in Chicago as hundreds of workers were detained. Many protesters were beaten during interrogations to obtain contrived confessions. In the end, eight anarchists were put on trial and seven were convicted of conspiracy to commit murder. Four were hanged in November 1887, one committed suicide and three were later pardoned by Illinois governor, John Peter Altgeld. Thus transpired the violent confrontation between police and labour protesters in Chicago we know of today as the Haymarket Riot, which became a symbol of the international struggle for workers’ rights. It has been associated with May Day since its designation as International Workers’ Day by the Second International Labour Federation in 1889. Five years later, the origins for our September-based Labour Day were cast when another awful confrontation, again in Chicago, saw federal Marshals and the Army kill 30 striking Pullman Railroad strikers in 1894, putting an end to the Pullman walkout strikes, whereupon Congress as well as President Grover Cleveland quickly passed and signed legislation for the holiday we know of today as Labour Day. That history is likewise rarely taught in schools. Not long afterword, the Industrial Workers of the World (IWW) were established in Chicago, in 1905, by members of the socialist-led Western Federation of Miners and other groups opposed to what they saw as “class collaboration” by a co-opted American Federation of Labour (AFL). The driving force behind the IWW was William D. Haywood, the leader of the Western Federation of Miners, which had established a reputation for work stoppages in Colorado mines. Joining Haywood at the launch of the IWW, which he described as the “first continental congress of the working class,” were Eugene V. Debs of the Socialist Party, and Daniel De Leon of the Socialist Labour Party. Also present was “angel of the miners” Mother Jones, as well as Lucy Parsons, whose husband had been executed in the Haymarket riot. Then in early 1914, Henry Ford’s Detroit-based automobile company broke ground in labour policies and made history. Against a backdrop of widespread unemployment and increasing labour unrest (sound familiar? ), Ford announced that the company would pay its male factory workers a minimum wage of $5 per eight-hour day, upped from a previous rate of $2.34 for nine hours. This same policy would be adopted for female workers two years later in 1916. The news shocked many in the industry–at the time, $5 per day was nearly double what the average auto worker made–but turned out to be a stroke of brilliance, immediately boosting productivity along the assembly line and building a sense of company loyalty and pride among Ford’s workers. This concept is simple enough to grasp, even in our consumer-capitalist-monetary system; if your workers don’t have money, they won’t be able to buy your products. But all economic systems seem to work best when units of exchange are in motion, and tend to stagnate, deteriorate and collapse when units of exchange are hoarded. Indeed as we repeatedly sow the seeds of corporate greed, business who seek to emulate Ford’s common-sense example are berated for acting like “socialists.” For example, Dan Price – the CEO of a Seattle-based company – announced last month he would pay all of his employees a minimum annual salary of $70,000, lowering his own pay to the same from his previous multi-million dollar annual earnings. This follows Seattle city-council woman Kshama Sawant‘s successful campaign to establish a Seattle minimum wage of $15. Despite the elite’s efforts to quash this wave of Seattle-inspired equality, protests are mounting worldwide against economic austerity. As anti-austerity protests coalesce in Spain, Greece, Turkey, and Argentina, many Americans are beginning to remember the true meaning of May Day. Yesterday thousands rallied in the streets of downtown Los Angeles for May Day marching for worker and immigrant rights with an emphasis on pushing for that $15/hour minimum wage. 3,000 miles away on the opposite end of the continent thousands of New Yorkers marched for “black lives matter” and “no justice no peace,” merging the Freddie Gray movement with May Day’s 124-year crusade for workers’ rights, likewise calling for a minimum wage hike to $15, as well as an end to tax loopholes for America’s wealthiest tycoons. Everything our grandparents fought to secure has been under continuous attack, and the more things change the more they seem to stay the same. History doesn’t repeat, but it does rhyme; the prohibition of collective bargaining in the 19th Century in the name of free trade mirrors our contemporary woes with NAFTA, the WTO, and the present trade deal to end all trade deals, the Trans-Pacific Partnership (TPP) coupled with the Trans-Atlantic Trade and Investment Partnership (T-TIP). The merciless crackdown on the popular majority by police, Marshals and even the military is repeating again before our eyes in the streets of Maryland, where the National Guard have been deployed and a 10 pm to 5 am curfew remains in effect following citizen outrage stemming not only from the Freddie Gray murder by Baltimore authorities, but the observation of 110 other police murders in the area in the past four years. Finally, the call for a $15 per hour wage across the country as inspired by Seattle, Washington closely mirrors Henry Ford’s revitalization of economic prosperity one hundred years ago. Since the 1970’s wages have remained the same forcing Americans to work more jobs with longer hours while simultaneously borrowing loans at ever-increasing rates of interest just to make ends meet. Automation has given birth to the phenomena of “Technological Unemployment,” jobs are now outsourced to 3rd world sweatshops as well as prisons, while immigration coupled with mothers entering America’s workforce have further exacerbated declining standards for employees seeking their slice of the American Dream. But none of that would be a problem if the ownership class weren’t so obsessed with their addictions to greed and power. This is perhaps why George Carlin famously declared that we’d have to be asleep to believe in the American Dream, because it is a pyramid scheme. Despite our many decades of enjoying the benefits of what worldwide exploitation of other cultures and countries has to offer, surmounting global austerity ensures more and more that the last vestiges of the west’s Middle Class will now feel the full weight of our own system’s oppression. Now that it’s our turn to experience the horrors of inequality, the exploitation we’ve allowed to happen the world over, while conveniently ignoring the outright enslavement of people who toil over slave-made Wal-Mart products on our behalf, the situation doesn’t seem so trivial anymore.